Go to the step by Step MasterTab. This is where you enter the data to be placed on a map . You'll find some example data that looks like this. 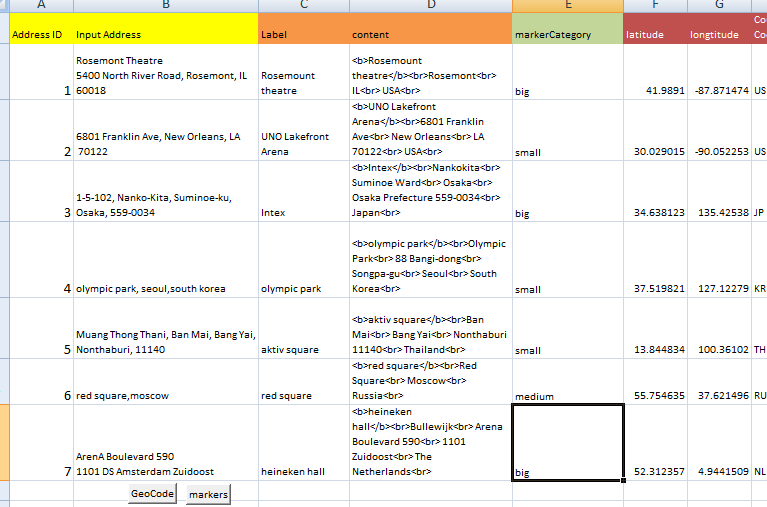 The columns in Yellow were already completed in How to Geocode addresses using Google Maps, the latitude and longtitude would already have been calculated, and the orange columns were already completed in How to put markers on maps. Now you need to provide data in the green column. Here you will be providing your choice of categories against each record. You can use whatever categories you want here, and however many you want. You can also use multiple categories. 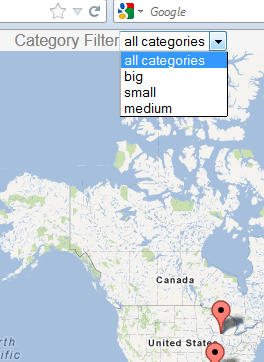 Hit the markers button and the plotted map will have a new drop down box as follows. Selecting a category will hide all the markers not in that category.